Using personality assessment tests with your current employees – and sharing the results with them – can help team members better understand each other, which is a win-win for all involved. When employees understand how their co-workers and managers prefer to communicate, the workplace becomes a more productive, comfortable environment. A personality test also can also inspire self-awareness. By taking a simple online test, employees can be more aware of the way they approach issues and feel most comfortable in the workplace. It forces your employees to see the differences between what the test says about them and what they think about themselves. Step 1: Choose a personality assessment test that identifies introverts and extroverts. As you probably already know, extroverts and introverts approach work and social processes differently, which can cause unwanted friction. Taking time to identify introverts and extroverts can help teams find better ways to connect. Two of the most popular tests used in the workplace are the Myers-Briggs Type Indicator and the DiSC Profile. The combination of their preferences among the above make up a person’s type. For example, someone with the preferences of introverted, intuitive, judging and feeling is classified as “INJF.” Myers-Briggs has extensive information about each type, including stressors and motivators. Results from the DiSC model are presented on a circle, with a dot falling in one of the quadrants, so test takers can see where their personality lies and identify how much of each quadrant is relevant to them. Other tests offer facilitation to help trainers effectively lead personality assessment sessions. Depending on the size of your company and available resources, whether the test’s authors offer to assist with training processes may factor into which model you choose. Step 2: Communicate with managers and employees. Before you administer the test, talk with managers about why. Giving them time to understand how it will enable them to be better leaders and benefit their teams can turn them into fellow advocates. Discuss with managers how and when you’ll share results, which they can use to improve team engagement and productivity. How your front-line managers utilize test results in the day-to-day will impact employee engagement more than anything else, so it’s vital they’re on the same page as you. This can be accomplished with an initial email, followed by a short meeting to answer any questions or concerns. When letting employees know about the test, it’s important they understand it’s strictly a tool to understand each other better and work well together. Also, stress to employees that there are no right or wrong answers. Results will be skewed if employees answer questions the way they think they’re expected. Let employees and managers know that after the entire team has completed the test, HR will conduct a session to discuss results. 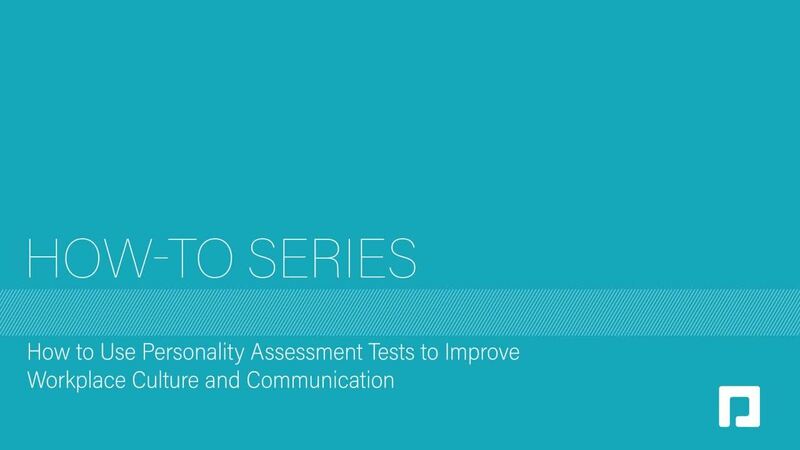 Using personality tests effectively is all about sharing and talking about the outcomes. There’s no need for employees to keep their results to themselves. Step 3: Administer the test. If a personality assessment is led by HR instead of the team’s leader or manager, employees can use will learn how to interact with their own manager from an outside perspective. Various models have different guidelines for administering tests to teams. Both DiSC and MBTI offer options for corporations and teams with variable pricing, and a program your HR team could take to become certified administrators. Since the test is important, employees should be given an adequate amount of time to complete it. Although many personality assessments can be taken with a pencil and paper, it’s handy to take advantage of the online version. Scoring is automatic, allowing employees to review their results before the group discussion. When you send the link to the online test to your teams, include a completion deadline; one week should be enough time. Be sure to communicate the estimated time the test will take, and be generous; don’t say it takes 10 minutes if it took you 10 minutes to complete. Most test companies will share an estimate for proper completion. After the test is complete, it’s vital to store the data. Keeping track of this information can help you better evaluate conflicts, recognize high performers and address communication issues on teams. Store the information with employees’ files or in a location with the rest of their team’s information. Also, be sure to note employees’ titles. You may consider keeping a spreadsheet with employees’ results for quicker access. However, make sure you regularly update the spreadsheet to reflect your current workforce and keep it in a safe place. Paycom clients: Create a custom field in Document and Task Management to securely store personality test data with employees’ other HR information. Then, you quickly and easily can organize employees by personality type to further identify trends. Step 4: Communicate results with managers and employees. Before and after the group discussion of results, conduct a one-on-one meeting with managers to go over the results and provide specific insights. Setting aside this meeting time will help your managers – especially new ones – understand how to communicate with their teams based on personality assessment tests. When it’s time to share results with the team as a whole, give them as much context as possible. Information from these assessments can help immediate supervisors better understand their direct reports, and vice versa, especially when it comes to communication style or conflict management. Make it clear there is no “correct” personality type for your business; no employee should feel like their results make them less than others. By taking the personality assessment test and then reviewing the results together, employees will learn more about their co-workers and the best ways to interact with them. Sharing and discussing the results helps employees understand their own personalities and tendencies. Even if they disagree with the outcome, it’s an opportunity for them to share their own assessment of their personality in a safe environment. Avoid simply letting everyone know what each other scored and leaving it at that. The most important part of this process is looking at what the results mean and discussing them together. For example, what does it mean to be an ENFP or an INTP? What does it mean to be a “C” or an “S” with “i” tendencies? Those are the questions you must answer in the group session; luckily, both DiSC and MTBI offer a lot of information to help you do so. Additionally, allow participants to ask questions and discuss results that surprised them or confirmed their perceptions about themselves. However, avoid making the mistake of taking every assessment at face value – and let your employees know that, too. People are complex, so one test can’t tell you everything you need to know about how to interact with each other. About a month or so after the group session, schedule another meeting with the managers to discuss how communication has changed their teams. What you learn in this session can help you plan additional tests for other departments. Step 5: Use the data to strategically attract and engage great talent. The information gained from personality tests also can help your company make smarter hiring decisions. The data may help you identify who is a “cultural fit” for your organization so you can craft better job descriptions. However, this should be approached carefully. The best way to strategically attract top talent is by using the data you have about your current workforce to create job descriptions that are accurate and appeal to the people you want to apply. With management’s input, pull reports for personality trends of your top performers to identify if a correlation exist with their personality test results. Perhaps they’re a mix of introverts and extroverts, but both value independence. If so, you will learn employees prefer the freedom to do their job as they see fit, without management interference. In interviews, encourage managers and recruiters to ask questions based on personality type. If your best employees mostly prefer to work alone quietly, job candidates who say they work best in a team and prefer constant brainstorming, interaction and feedback might not make an ideal hire. In your applicant tracking system, you can include knockout questions along the same lines to identify candidates you may not want to bring in for an interview. You’ll also want to update your onboarding process to include taking whichever personality assessment you’ve deemed is right for your organization. Taking the time to get to know new employees this way helps them feel engaged and connected to your company culture faster. Scheduling time with them to discuss their results with their manager – or with HR – and how those results relate with the rest of the team is important. For example, you could take this time to let a new employee know many people on the team are introverts who often wear headphones to help them focus, but that new hires should not feel like they can’t approach someone wearing headphones. The opposite is also true: If an introverted new hire joins a team of extroverts, you would let him or her know it’s OK to use headphones to help them focus and be productive. Paycom clients: Add a link to the assessment as a required step on your New Hire Checklist within Document and Task Management. Then, add a task for the new hire to discuss results with his or her manager. Conclusion: Understanding each other boosts employee engagement. While some may scoff at the accuracy of personality assessments, one thing is for certain: When given the opportunity to take a test at work, your employees can evaluate how they view themselves and how others may perceive them. It may not be a completely accurate portrayal of someone’s personality (and honestly, how could one internet-based test be?) but it will give your workforce insight into one another. Using workplace personality tests helps your teams understand how their co-workers are different, and helps managers better understand their direct reports. The results can shine a light on ways you can adapt your processes in a way that will be most effective for different teams in your organization. To learn more about how to connect with members of your workforce, download our free white paper, What Employees Want: Overlooked Insights in Employee Engagement.